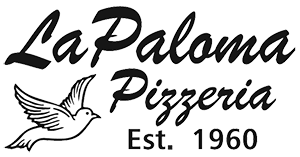 Online ordering menu for LaPaloma Pizzeria. Pizza made the old fashioned way, hand-tossed using a recipe that has been handed down through the family for years! Do you like a thin New York City style crust, or is a deep dish thick crust pizza more your preference? Is it cheese & pepperoni, or fresh veggies? White or traditional, square or round--no matter what your taste, LaPaloma's will make it your way. ————————————————————— We're north of Broadway, between Crittenden Road & Emerson Street. Find us near Alden High School & the Town Park.